At the core of community is the sharing of food. A farmer’s market is a shared space wherein folks meet face to face and talk about food. Perhaps this explains why the number of farmer’s markets nationwide have increased from 1755 in 1996 to 8,144 in 2013. A farmer’s market connects people together. A farmer’s market provides space for friendly conversations with folks who actually have grown, harvested and prepared food. Folks at a farmer’s market share not only the food itself, but also information about how the food is grown and prepared. Shoppers at a farmer’s market can ask questions and express their preferences in face to face conversations with vendors. ‘Walkable space’ is a term used by city planners and developers to refer to a shared space within community that is accessible on foot. There’s really nothing new about this concept—in plain English, we call this space a “park”. Such shared spaces seem to connect people together and enhance the quality of life in a community. 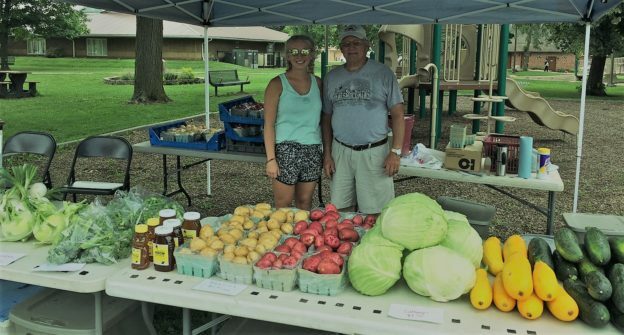 Here in DeWitt our farmer’s market is centrally located on the east side of Lincoln Park Thursday afternoons (between 3:30-6:30PM) from May thru October. Although we struggle from time to time with unpleasant weather, on good days many folks seem to enjoy a walk to the market from their homes. There is grass, shade, benches, and picnic tables, and a playground nearby. The DeWitt Farmer’s Market is a relaxing way to get some exercise on a summer afternoon and to visit with neighbors. It doesn’t cost as much money as some other outdoor entertainment. It’s truly a nice walk in the park. This entry was posted in Community Insights, DeWitt Delivers, Get Involved!, Look Local First, Shopping & Dining, Tourism and tagged Agriculture, DeWitt, DeWitt Delivers, downtown DeWitt, Family Farm, Farmer's Market, farming, Lincoln Park, Look Local First on July 20, 2017 by admin. A Sunny Outlook For Business! Crossroads Triathlon Step One: Sign Up! !